This is an archived version of the now defunct GAC website, reproduced here by the permission of the webmaster, Jon Cooke. We are currently working on reformatting and transferring all the files. On the main page, any link with an asterix next to it is one that has not been completed yet. Be patient ... we'll get there! Welcome to The Walter Lantz Cartune Encyclopedia! Born in 1899 to an immigrant Italian family in New Rochelle, New York, Walter Lantz began working in the field of animation at the age of sixteen. In 1922, he moved to New York City where he assumed a directing position at the John R. Bray Studios. 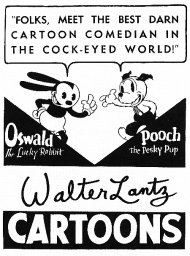 Lantz introduced his first original cartoon creation, Dinky Doodle, in 1924. In 1927, Lantz set his sights on Hollywood. He briefly worked for film director Frank Capra and then as a gag writer for Mack Sennett. After this, he returned to directing animated cartoons, this time under Charles B. Mintz for the Oswald the Lucky Rabbit series. 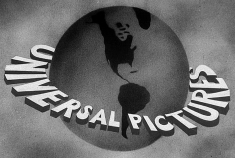 By 1929, however, Universal decided to remove Mintz and produce the Oswalds directly on the studio lot under new management. While schmoozing with Universal president Carl Laemmle, Lantz wagered a poker bet against the movie mogul for ownership of the new animation studio. In the end, Lantz won and the studio was his. After the Oswald series ran its course, Lantz decided to try out a few new characters. His most successful creation came in 1940 with Woody Woodpecker – the zany bird whose memorable laugh became an instant success with the American theater-going public. Andy Panda, Chilly Willy, and Wally Walrus were just some of the other creations that the Lantz studio brought to the silver screen. 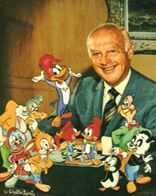 Walter Lantz passed away in 1994 but the cartoons he produced and directed still seem as fresh and funny today as they did when they were first released. 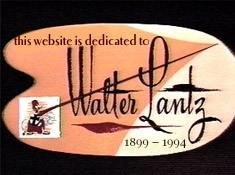 This comprehensive website, online since 2002, serves as an encyclopedia of every single cartoon produced by Lantz and his talented staff. Our goal is to make it as complete as possible. So browse around and learn about the men and women who made these shorts the bona fide classics of today. OWN CLASSIC WALTER LANTZ ANIMATION ON DVD TODAY! If you're a fan of Walter Lantz, don't miss both volumes of The Woody Woodpecker and Friends Classic Cartoon Collection DVD series from Universal Studios Home Entertainment. Each 3-disc set features 75 vintage cartoons with all your favorite characters, including many rarely seen shorts, all complete and uncut. Plus, amazing bonus features from the Lantz archive. For more information, see our DVD Guide. No permission is granted to republish this document without consent of the authors.